Jan 30 What do you prefer? A villa immersed in the green with Lake Lugano view or directly on the lake? All with price reductions. The whole Lake Lugano Region offers attractive residential areas, with open view overlooking mountains and lake or directly on the lake. The proximity of the center of Lugano is as important as a good infrastructure near the property and a good relation between price and quality. Depending on the lifestyle you would like to live in Ticino, these properties offer different advantages with a price reduction til 25%. Are you looking for a property in top condition ready to move in? In that case I present you this wounderful Mediterranean villa in Carona, one of the most historical villages in Ticino, with Lake Lugano views, south of Lugano and Mount San Salvatore. It offers large and bright interiors with garden and terrace. This villa is perfect for families. Profit now of a price reduction of 9%. Even more large and luxurious, the “Villa Sassa” in Ruvigliana offers one of the most dominant position with stunning view of Lugano Lake. East of Lugano oriented, lies at the base of Mount Brè, immersed in the green. The villa offers a wonderful covered pool and nice terraces. Profit now of a price reduction of 15%. Do you prefer to realize your personal ideas? Discover the building plot in Comano, near Lugano, with house to be renovated. Here you are immersed in the green, even if the center of Lugano is just 6 km away. With a big plot and part of a wood, you can choose to renovate the existing house or to design a new construction until 1'000 m² of living area. Profit now of a price reduction of 18%. The "Villa Mainini” historical luxury villa in Caslano, directly on the lake, south west oriented. The architecture of this property, similar to a castle, is just unique. The project for a renovation of the historical part and construction of an additional building with technical room, garage and outside pool has been authorized. Profit now of a price reduction of 25%. With pleasure I will share further details about the lifestyles that those properties offer. I invite you to a personal property tour. Spectacular villa for sale in Mediterranean style, built in 1973 and renovated in 2003. Located in the municipality of Lugano-Carona, with beautiful Lake Lugano and mountain view, 8.3 km to the city centre of Lugano and to the highway exit. The villa offers bright interiors, alarm system, a cozy terrace with access to the beautiful garden and 2 outdoor covered parking places. 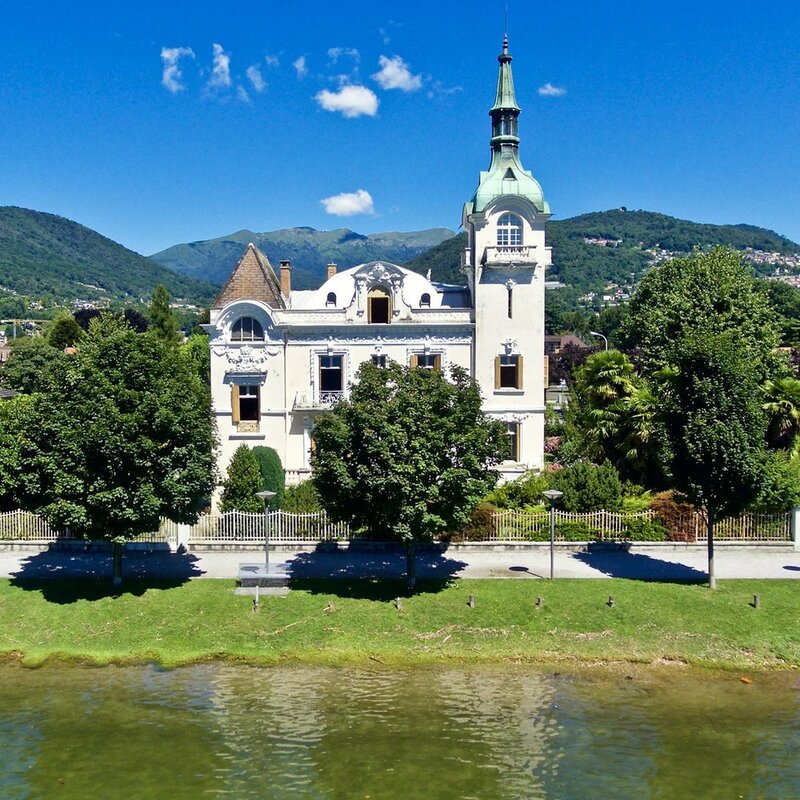 Historical villa of 1900 for sale, located on the prestigious hill of Ruvigliana-Monte Brè, in a sunny and quiet position, facing south, completely in the green with beautiful view over lake and mountains, only 5 km from the centre of Lugano. The classic villa, on 4 levels, has been redone and extended in 2004 and has beautiful porches and terraces, a swimming pool and a garage for 5 cars.